October is National Chiropractic Health Month, sponsored annually by the American Chiropractic Association (ACA) to raise national public awareness about chiropractic services. This year’s campaign’s theme is “Conservative Care First!”, aiming to educate the public on why a conservative, non-invasive approach to healthcare is both safe and effective. Rather than patients seeking non-invasive care options after experimenting with riskier approaches, the ACA advises starting with conservative approaches to reduce risk and experience results. Disc degeneration: One of the detriments of aging, disc degeneration refers to the breaking down of discs that serve as cushions between vertebrae. Without these discs functioning and cushioning the spine properly, pain is caused. Degenerated discs can also lead to improper movement of the area of the spine that is affected, as another role of the discs is to absorb shock and stress on the spine. Herniated discs: This phenomenon refers to when the disc leaks the inside “jelly” onto a nerve, causing it to be pinched or inflamed. Pain from herniated discs can be referred, meaning that though the source of the pain is the spine, the patient is experiencing pain in other areas of the body, like the leg. When a pinched nerve causes leg pain it is known as sciatica. 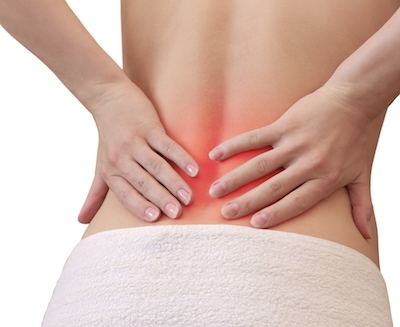 Injuries: When the spine is injured, back pain is one of the clear symptoms. These injuries are often sprains, which are tears in the ligaments that support the spine, and are often caused by lifting something with the back instead of the knees. Putting this undue stress on the spine, when it does not have the proper flexibility or strength to do so, leads to injury, and therefore pain. Pre-existing Conditions: Many patients have pre-existing conditions that have back pain as a symptom. These can include those that you are born with, like scoliosis or spina bifida, or conditions that are a result of aging, such as osteoarthritis or spondylosis (disc degeneration). Treatment for these conditions vary, but there are conservative options available for all of them. Lifestyle Changes: For patients who are smokers and do not have an active lifestyle, there are some immediate changes to make. Quitting smoking increases blood flow in the spine, promoting strength and flexibility. Frequent exercise also strengthens the muscles surrounding the spine, making you less inclined for injury. Even if you have experienced an injury, exercise can help to move the recovery process along. Following simple tips for preventing back injury while instituting lifestyle changes will ensure that you both prevent further injury, and heal your pre-existing one quickly. Physical Therapy: Physical therapists promote proper postural alignment and focus on increasing muscular strength, endurance, and flexibility. Therapists focus on a variety of therapies and exercises that restore function and reduce pain. Usually, these therapeutic techniques can also be applied in the home setting, adding to the efficiency of recovery. The techniques are non-invasive and safe. Chiropractic Care: After a chiropractor has assessed the patient’s symptoms and medical history, they will determine whether or not a chiropractic manipulation, known as an adjustment, would be a beneficial treatment. The purpose of this procedure is to realign the spinal vertebrae that are out of alignment. When the vertebrae are out of alignment, spinal nerves become irritated which interrupts the flow from the brain to the tissue. Spinal Decompression Therapy: This innovative technique uses a revolutionary technology to treat disc injuries in the back and neck. The therapy works by slowly separating vertebrae from each other, which creates a vacuum inside the discs. The negative pressure, which is the result of the vacuum, can induce a retraction of the herniated or bulging disc. The process happens microscopically over six to eight weeks, with the length depending on the patient’s progress. Surgery: Always viewed as a last resort, spine surgery is sometimes needed in cases where patients do not respond to methods of conservative treatment. Before undergoing any surgery, patients should ask their doctor many questions and it is also recommended to seek a second opinion. Minimally invasive surgical options are also available for eligible patients. In these procedures, an endoscope is inserted to remove pain-causing tissue. At Montvale Health & Wellness, our team of healthcare professionals can use any of the aforementioned treatment options to help those dealing with back pain.